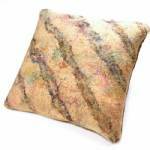 The front of this one-of-a-kind pillow features a square of my handmade art felt. The felt has a background of golden tan wool covered with a diagonal stripes of dark brown silk. A spiderweb of brightly colored silk threads adds closeup interest. The back of the pillow is a soft garment leather in a medium warm brown. The closure is a heavyweight brass zipper. The commercial pillow insert (included) contains polyester fiberfill and is a generous 14 by 14 inches. Gently vacuum or brush as needed to remove dirt. Spot clean with water-based cleaner and soft cloth. One available as shown. Availability of this item is subject to local sale.